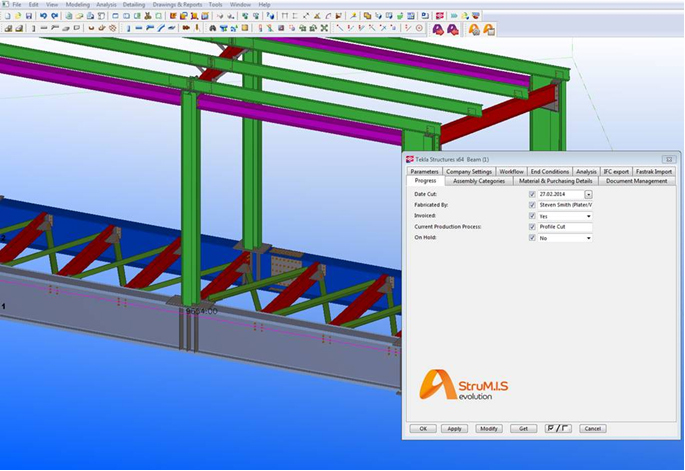 STRUMIS LTD are delighted to announce the release of their innovative new STRUMIS to Tekla® Structures Data Exchange. This new link improves on STRUMIS’ already outstanding connections to 3rd party systems, by providing Tekla® Structures users with access to real time STRUMIS contract data. The first is to establish the link from Tekla® Structures to the associated STRUMIS contract. This can be done over a local network or via the internet, meaning that Tekla® Structures users can remotely connect to a STRUMIS contract no matter where their location. The second stage allows the contract status of items/assemblies to be enquired upon from within the Tekla® Structures modeling environment. Selecting objects allows the user to acquire information such as production and QS status, material and purchasing details and also document management information. The STRUMIS to Tekla® Structures Data Exchange will be available with the upcoming STRUMIS version 9.1 and will be compatible with Tekla® Structures versions 16 to present.